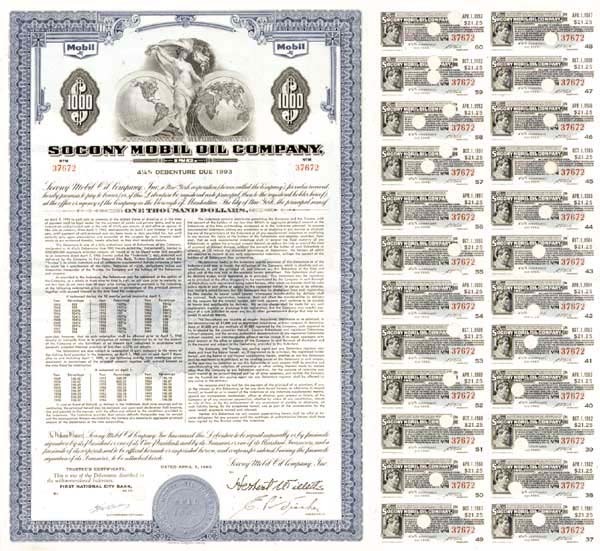 $1,000 Oil Bond. Very graceful vignette of a seminude female figure with two globes. American Bank Note Co. Many coupons. Scarce!!! A bond is a document of title for a loan. Bonds are issued, not only by businesses, but also by national, state or city governments, or other public bodies, or sometimes by individuals. Bonds are a loan to the company or other body. They are normally repayable within a stated period of time. Bonds earn interest at a fixed rate, which must usually be paid by the undertaking regardless of its financial results. A bondholder is a creditor of the undertaking.